The European Adavntage Conference had its second stop in Kassel Germany on April 14th and 15th. There were about 50 attendees from around Southern Europe. We taught the same classes as we did in London last week. Just like London we had great participation from the attendees and we received a lot of good feedback about how they are using Advantage. Once again I would like to thank all of the people who attended the conference. 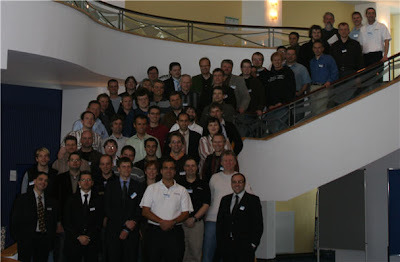 I would also like to thank the Advantage staff from the iAnywhere office in Germany. Kemal Haslaman, Tiberius Stelli and Joachim Duerr were the ones who really made this event work. Be sure to watch the web site for the next Advantage Conference. The European Advantage Conference (EAC) began in London on Thursday. It is always an excellent conference and this year was no exception. The schedule is very busy with 4 separate tracks along with three group sessions. This makes for some very long days but they are very valuable. We received some excellent ideas and feedback from all the attendees. I would like to thank all of the people who attended my sessions and I look forward to coming back again. The Advantage Technical Summit began today in Boise Idaho. The summit is two days of Advantage specific training taught by the Advantage staff. The event is held at least twice a year and is well worth the trip to beautiful Boise. We hope to see you at our next training, visit the Advantage web site for details on the next event.